The Wanderer brand name, which is now part of Audi, was first seen in 1911 on road cars for the 1912 model year. The company dates back to 1896 and they built cars until 1941 and military vehicles until the end of the war. But it became part of Auto Union in 1932. As Audi is the only surviving member of Auto Union, this marque sort of lies dormant somewhere in Audi’s basement. Wanderer wanted a competitor to BMW’s successful 328 so they contracted with Porsche to design a beastly engine. And that’s just what he did. The 2.0-liter straight-six was supercharged in W25 K form and put out 85 horsepower. The top speed was 90 MPH. Only offered for three years (1936 through 1938), the W25 K was sold in low numbers – only 258 were built, the final 37 of which were sold as “W25” – without the supercharger. It’s a very stylish car and one that doesn’t come up often. It’s every bit as sporty as a BMW 328 and a lot less common. It will likely sell for between $450,000-$650,000. Click here for more info and here for more from this sale. Update II: Sold, Bonhams, Preserving the Automobile, Philadelphia 2015, $319,000. 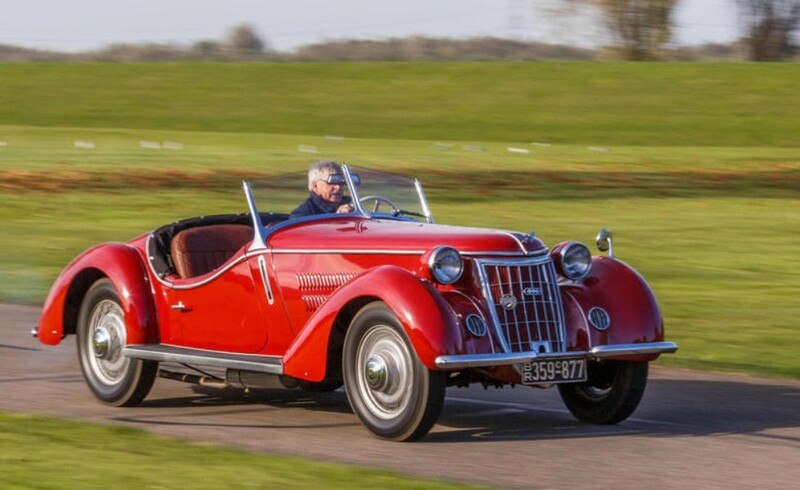 This entry was posted in Uncategorized and tagged 1936, auctions, Bonhams, cars, classic cars, roadster, w25 k, wanderer by classiccarweekly. Bookmark the permalink.